Dr. Joseph B. Marion, N.D.
7 Chapters Describe 90 VITAMINS ~ 100 MINERALS ~ 55 AMINO ACIDS ~ 450 POWER FOODS ~ 900 HERBS ~ BODY & BRAIN ANTI-AGING With Neurotransmitters & Hormones ~ 1,600 CONDITIONS & CURES Listing 1000's of Natural Remedies. TOP ANTI-AGING SOURCE For INSTANT Alphabetic REFERENCE By TABLE of CONTENTS And Huge INDEX. Anti-Aging Encyclopedia of Natural Health Professionalizes Your Staff's Presentation. Get this unparallelled 4-Year Natural-Nutrition Course in One Volume. Your Body Cells Are Your Best Friends, Why Not Keep Them That Way? Purchase the professional model from Information Pioneers Publisher. OR, YOUR MONEY BACK. Call (310) 339-9777. 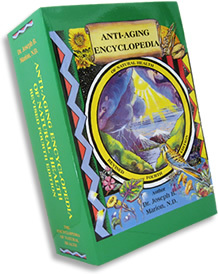 SEE ANTI-AGING ENCYCLOPEDIA on Amazon.com, a MUST SEE!! "I use your Anti-Aging Encyclopedia of Natural Health as a reference guide all the time. I'm a dentist, natural health care and environmental stress consultant. People don't yet realize the trauma that occurred to our Health by the 9-11 tradgedy. On Cape Cod we all became very ill, and are lucky to have survived this event. The technological stress and the electromagnetic pollution sections (of the book) were a guide for me to identify the worst offenders to our health on Cape Cod...battleground from military radar, satellites, microwaves, cell phones et all." Dr.April Johnson, The Healing Center, Monument Beach, Massachusetts 5/20/02. "After looking over a copy, all I can say is excellent, very accurate." "The content of the book is excellent and will be of great use in my clinical practice." Dr. John Power, Croydon, Victoria, Australia, 5/29/99. "I have been researching for over 35 years and I must say, your Anti-Aging Encyclopedia of Natural Health is the best. NO ONE and I repeat - NO ONE has accomplished so great a task as yours! The Manual is so detailed and comprehensive that sometimes I find myself saying, 'Certainly Marion hasn't covered this element - but sure enough, there it is! You are to be congratulated for such an astounding Manual. I have and shall continue to recommend your Manual to others." Dr. Howard Davis, L.A., Cal, 6/99. "I am delighted even more about the book. I have 300+ books and I know if I ever have to downsize, Joseph's book will be the 1st one saved." "Fantastic Manual, could only have been done with a huge computer memory." "Please tell Mr. Marion I love his book. I thank him for writing such an all-inclusive tome on health." Louise Hotten, San Diego, California, 12/20/99. Chuck Hoeft, Houston, Texas, 12/17/99. "Let me congratulate Joseph Marion for writing such a thorough and comprehensive resource - Anti-Aging Encyclopedia of Natural Health. I am so excited and impressed with your book. Let me commend you on producing such a wonderful resource." Adam Tate, Heathridge, Western Australia, 5/18/2000. ""I want you to know that I have gained much from your Anti-Aging Encyclopedia of Natural Health, and thusly many others as well because of you. Thank you muchly!!!" Vance Maxwell, Park City, Utah, 6/25/2000. "I am reading the Anti-Aging Encyclopedia of Natural Health day by day. What an extraordinary accomplishment for one man to do." Robert Redeen, Pennsylvania, 12/6/2000. "Several months ago I visited the Sunrise Trading Company, who shared your amazing book the Anti-Aging Encyclopedia of Natural Health with me." Sharon Belland, Milford, Massachusetts, 2/5/2001. "We have used your book as our 'bible' of information. We have found it to be truthful and to the point. Thank you for all your hard work. We would like to use some of the information stated in your book in our explanations of what is in our products" (referring to HGH). Denise Donovan, D.D.C., San Clemente, Cal, 8/21/01. "I always appreciate the great book you have, the Anti-Aging Encyclopedia of Natural Health, Joe. It's really the best I've ever seen in this industry. I use it all the time, and recommend it to our customers." John Pollard, Edge of the Woods Natural Foods Market, New Haven, Connecticut, 9/15/2001. "Thanks for all of your work in publishing such an incredible book." David Perschon, Salt Lake City, Utah, 1/22/02. "To Dr. Joseph Marion; First of all , I would like to thank Dr. Marion for my health, the health of my family and the health of my friends. I feel very strongly that he is a genius and should be awarded the Nobel Peace Prize for literature for the finest book I have ever read. The facts contained in his book will save the lives of many people and bring a better quality of life to whomever reads it and follows his advise. My mother is just one example whom this book has helped. She was on Paxil for over 14 years and before I bought his book, she couldn't be without her medication or she would go into deep depression, tremendous fear, anxiety and just horrendous emotions that it would break my heart as I felt so helpless. I began reading Dr. Marions book and recommended that she try some new and natural methods, ie., Indium, Royal Jelly, bee pollen, Chlorella and better eating habits. My mother just turned 60 on April 12th and she has the spirit and health of a young woman-- this just 8 months of being off Paxil. I write these words strickly form one man's own feelings from the heart, mind and spirit ! It will be one of my greatest honors to meet and thank this man in person for I will never be able to praise and thank Dr. Marion enough. !!!" "P.S. I would have paid $500.00 for this book-it is truly invaluable." Author: Dr. Joseph B. Marion, N.D.
Indium! Raising the amount of minerals a gland can absorb is a nutritional breakthrough in glandular performance. Call Information Pioneers Publishers at (310) 339-9777. To peruse further literary manuscripts by Dr. Joseph Marion, see website www.InformationPioneers.com.